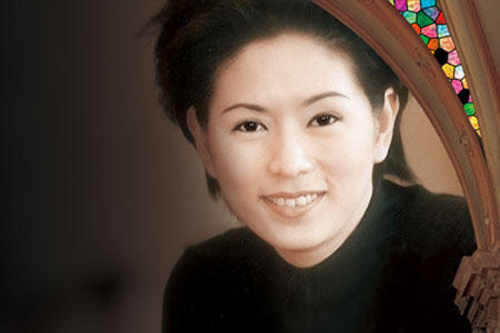 Former Hong Kong TVB actress, Jacqueline Law (羅慧娟), died in her Singapore home on June 30th. Jacqueline had suffered from pancreatic cancer for the past 2 years. She was critically hospitalized several times earlier this year. Experiencing hearing loss, depression, and pancreatic cancer, 46-year-old Jacqueline still maintained an optimistic view in life. 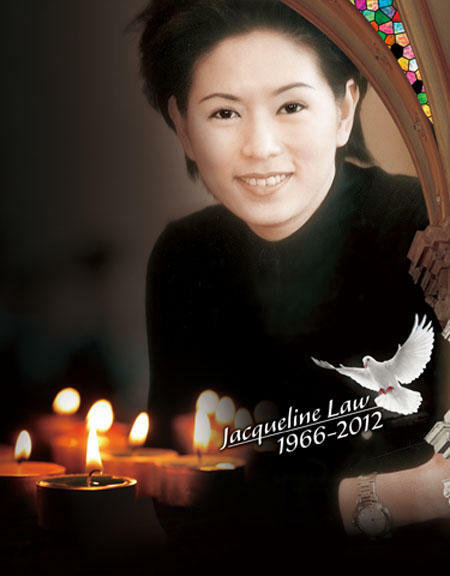 Jacqueline’s husband, 62-year-old Singapore Exchange Securities Director, Lau Chi Man (劉志敏), stated, “She will no longer endure any pain after leaving this world.” Marrying in 2008, Jacqueline was shortly diagnosed with pancreatic cancer in 2010. On June 30th, Jacqueline Law’s elder sister sent a message to the media, stating, “My sister, Jacqueline Law, has passed away peacefully in Singapore at 4:53 AM this morning.” At a press conference, her stepson also confirmed Jacqueline’s death, while attempting to hold in his tears. He said that the family was preparing for the funeral and that he would not reveal any related details because of his father’s (Jacqueline’s husband) will. It was rumoured that Jacqueline’s funeral is scheduled to take place on July 4th following Christian traditions and her body will be subsequently cremated. A memorial service will reportedly be held by her husband in Hong Kong on July 12th. Jacqueline’s acting career started when she starred in television drama, The Book and the Sword <書劍恩仇錄> in the 1980s. In 1999, she lost hearing ability in her right ear after a diving accident. Her father declared bankruptcy and she suffered from depression between 2000 and 2004. In 2010, she was diagnosed with cancer. Despite being seriously ill, she still continued her DVD production chronicling her journey of battling cancer in February. In April, three months before her death, she attended her stepson’s wedding banquet, while accompanied by her husband and mother-in-law. Jacqueline was once in a three-year relationship with Stephen Chow (周星馳). The pair fell in love after filming 1989’s The Final Combat <蓋世豪俠>, which propelled Stephen to stardom. The relationship reportedly ended because of Stephen’s mother’s objection. In February this year, Jacqueline held a farewell ceremony in Hong Kong, where she invited more than 20 close friends and relatives to attend. She expressed her post-death wishes to each of her close friends. Jacqueline’s family has a history of cancer, which took away the lives of her father and her husband’s ex-wife. On the day after Jacqueline’s death, reporters were unable to reach her close friends, Monica Chan (陳法蓉), Kitty Lai (黎美嫻), Sheren Tang (鄧萃雯), and Annie Liu (廖安麗). All of them were said to be on their way to Singapore to attend Jacqueline’s funeral. peacefully but she will remain in her fans’ heart filled with her love & cheerful smile. God love you & will receive you in his heaven! RIP . Pancreatic cancer is the worst cancer . my friend’s mom passed away from pancreatic cancer on June 29 after 5 months diagnosed wit it , one dau before jacqueline . Now they are gone peacefully to heaven . I sensed that Jacqueline’s suffering was coming to an end, especially since a JayneStars reader from Singapore had informed us that she saw Jacqueline hospitalized in a local Singapore facility. Jacqueline appeared to be a loving person and cherished her friends deeply. Her bright smile and cheerfulness will be remembered by fans as well. R.I.P Jacqueline, my deepest condolences to Jacqueline’s family. Very sad. Condolences to her family and her friends. RIP. Rest in peace Jacqueline Law. You’ll be missed! I really liked Jacqueline as an actress, and was lucky to see her perform in Toronto with Kitty Lai, Deric Wan and Mo Mo a long time ago. She was very friendly and even signed my magazines and took photos with me. I will surely miss her and sincere condolences to her family and friends. RIP 🙁 Will pray for you! Thanks for your link. I enjoyed watching the video clip on Jacqueline Law. May Jacqueline rest in peace, Amen. I am sure she will have a happy life in Heaven. RIP Jacqueline. Deepest sympathy to her family and friends! She became a Christian some years ago after she had hearing problem caused by diving. Soon after, she got married. Then 2 years after, she got pancreatic cancer. As a Christian, she had been inbued and ingrained to trust God. In February 2012, She was brave enough to brace the end of her life with her sharing of her preparedness of her ending of life and her loves and wishes to all of her close friends and relatives in HK. It showed how wonderful Christians are as they have God to take them to heaven. Christians have a stable and matured graces and emotions on death matters. They thus take their deaths with God’s grace. They remain happy and kept to their happiness. They do not have to cry, creating fear and anxiety, disturbing sadness and sorrowful when they prepare their eventual and final departures from this world. Her preparedness of death had drawn much respect from me. She was a wonderful who trusted God faithfully into her final days. She is now in peace and in good health in the arm of the Lord in heaven.